Finally, I've been through my images and here is one of my looks during Vancouver Fashion Week. I'm so excited to share this one with you. 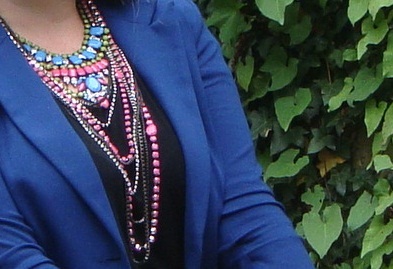 From my Micheal Kors blazer and my Peter Lang jewellery, the colours are vibrant and I'm showcasing a rainbow of bling. Blue Micheal Kors blazer (similar ones here and here), Black t-shirt (this one no longer available but I found two great ones here and here), vintage orange pants (buy great ones here and here), Orange wedges (see similar ones here or here), Peter Lang necklaces, Peter Lang ring. DKNY bag, Peter Lang ring.